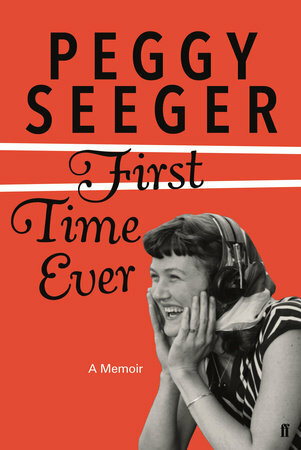 The best part of any story is in the telling, and so it is for Peggy Seeger’s memoir, First Time Ever (Faber & Faber) which was published last December. Seeger, the half-sister of legendary folk artist Pete Seeger, has written about her life with wit and sentimentality. Her story features a large cast of characters including family members, friends and musicians. Though she has amassed many accomplishments as a folk musician, most people may only know of Seeger as the partner of Ewan MacColl, the songwriter, historian and composer of “The First Time Ever I Saw Your Face,”, written for her in the first year of their liaison. But her achievements as an artist go much further and now, in her 82nd year, we get to enjoy the stories of her life from the front row. Seeger writes affectionately about her childhood which, as she grew up with so many musicians in her family, set the foundation for her life as an artist, claiming that “at two-years-old songs entered my bloodstream.” She started playing instruments at the age of six and unconsciously made a commitment to learning folk songs. Her entire memoir is full of her love for folk songs, not only from the United States, but also from Scotland, Ireland, Wales and England. All through her book she drops nuggets of music history while quoting lyrics to be read aloud, and making strong historical connections between traditional folk tunes and their roots. Once asked where she got her versions from, she replied, “The songs: I am theirs and they are mine while I’m here . . . I have nurtured them like children and brought them forth with me in time.” Seeger released her first album in 1955, Folk Songs of Courting and Complaint (Smithsonian/Folkways), recorded just after the death of her mother in November 1953. But the passages that have the most impact for me are Seeger’s assessments of herself, written with sobering frankness. Of her teenage years she says, “I was a lolloping, spontaneous loner who studied, made no friends, who sewed most of her own clothing . . . Could a girl grow up in the middle-class suburb in the Western world like that now . . . adventurous and ready for anything?” Upon meeting MacColl at an auction, in 1956, “I tottered in on high heels to meet my next thirty-three years. One woman and a tribe of older men and so much smoke in the room that I didn’t notice him at first.” It is to this part of Seeger’s story that she devotes the most pages. When she met him, MacColl was married, and nearly 15 years her senior but with an “intensity of passion” that absorbed her immeasurably during their entire time together. (She married him in 1977, after their long courtship, for tax reasons.) As she admits early on in the book, “ . . . I’m holding myself over a flame in this memoir hoping to discover a definitive identity”. In fact Seeger’s book occasionally reads as therapy: Who am I? Why am I here? What is my purpose? Deep questions that she asks but doesn’t necessarily answer to her own satisfaction or ours. Perhaps Seeger is still a work in progress. Nevertheless, her demeanor about life in general is very clear. Her attitude about judging one’s choices is practically absent, as she walks through life with an “of course; why not?” approach. Consequently, offers of trips to Europe or tours of Scotland on a scooter in poor weather gave her the opportunity to live spontaneously and in the moment, a freedom she granted herself often with the help and insistence of the passionate MacColl. But it wasn’t easy to have such an intense relationship, which included two children out of wedlock and three illegal abortions, and also pursue a life in music. Seeger’s remarkably earnest about her own feelings, which she characterizes with brutal cynicism, but she always found a way out of the emotional turmoil of loving an older man. She writes, “Our work saved us, the politics, the recording projects, the next Radio Ballad, the new songs we were learning and writing.” Clearly the bond between Seeger and MacColl was incredibly strong, enriched by their mutual love of meeting people around the world, a shared view of politics (on the left), and the all-important performing in front of an audience. Seeger’s key thoughts about living with MacColl come late in the book. “Ewan was easy to be with," she writes. "Night and day together for thirty years and I was never bored.” Then a terrific memory: in 1972, he receives a royalty cheque for $75,000, the same year their daughter Kitty is born and everything changes for the better (at least financially speaking): “It’s the end of twelve years of scraping, worrying, having to take every single paying job.” The royalty was partially earned from Roberta Flack’s version of “The First Time Ever I Saw Your Face,” recorded in 1969 but made a hit three years later, when it was featured in Clint Eastwood’s movie Play Misty For Me, his directorial debut. Seeger admits, “As per usual, we’d never heard of her . . . "
Seeger’s book of recollection is full of great tales about her life, but I would have liked more stories about her brother Mike, a fine musician and composer in his own right, and about Pete, who died in 2014 at the age of 94. She writes fondly of her siblings, especially during their dying days. 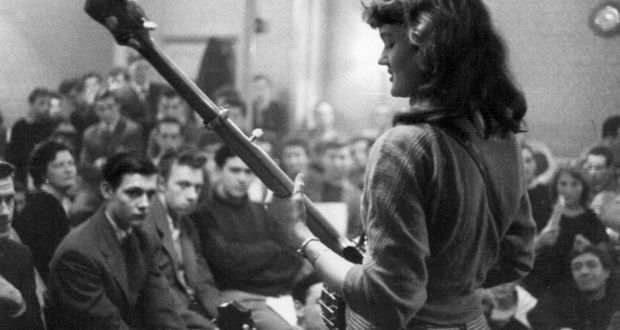 Now 82, Peggy Seeger has found a kind of peace with herself as the eldest among the Seeger clan, which still reunites every two years. I’m confident that she’ll continue to enrich her family with more stories as much as her memoir has enriched ours. A curated album based on the songs she writes about in her book is available on Bandcamp.